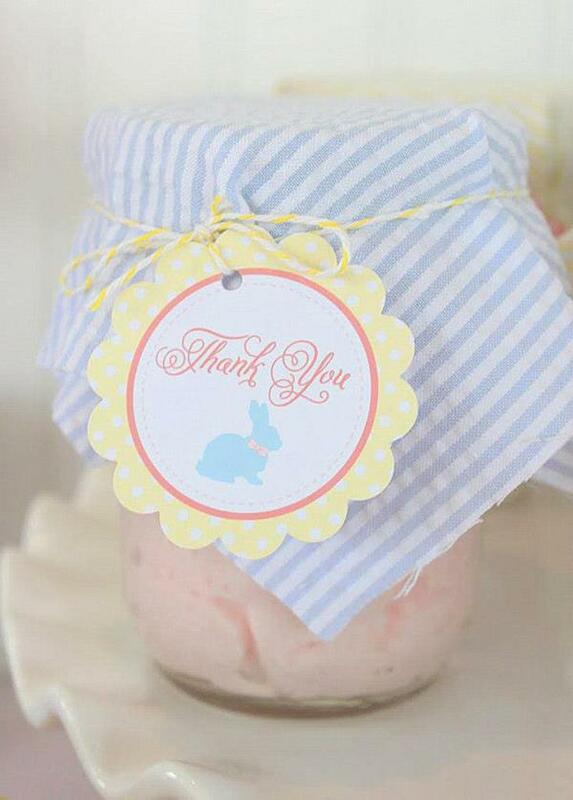 This adorable SEERSUCKER & BOW TIE EASTER PARTY was submitted by Deanna Talwalkar of Mirabelle Creations. 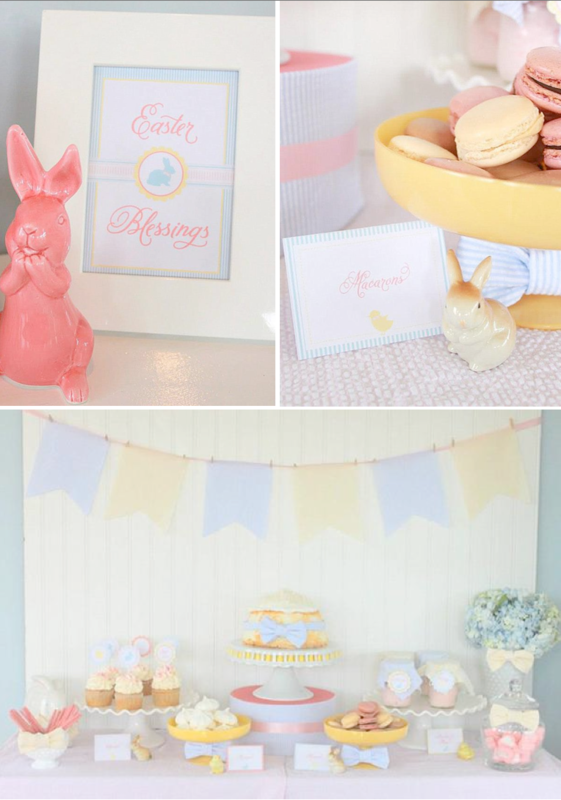 This party is full of charming and darling ideas that could be used for more than just an Easter party. 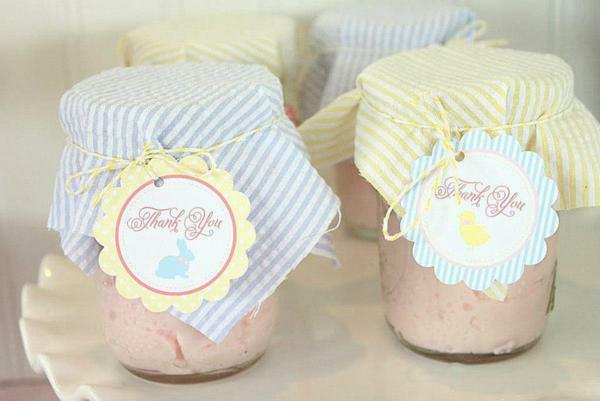 Many of the elements could be used for a baby shower or 1st birthday party, too! 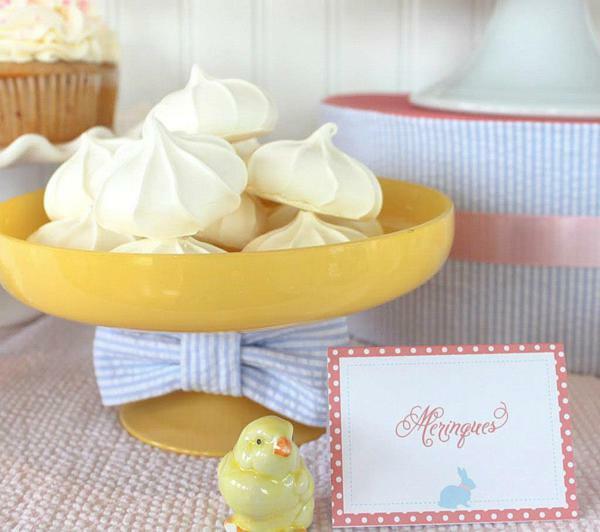 This is what Deanna said about planning the party– “This Easter party was inspired by two of my favorite southern spring fashion items — bow ties and seersucker print. 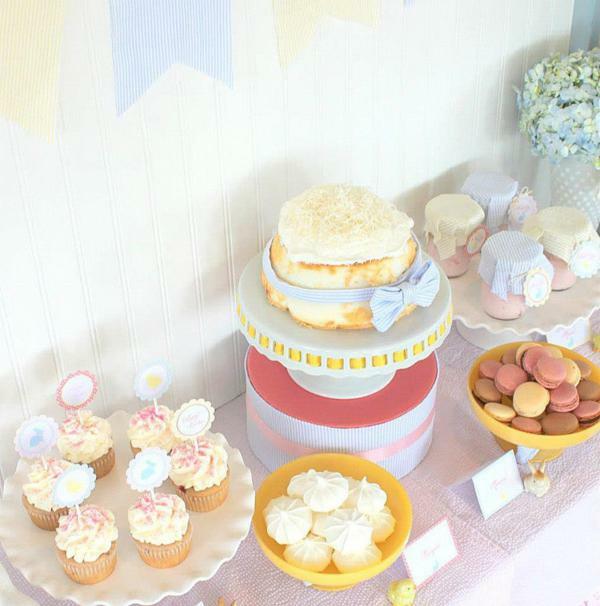 Dessert Table: The inspiration for the table started with pale pink, yellow, and light blue seersucker fabrics. 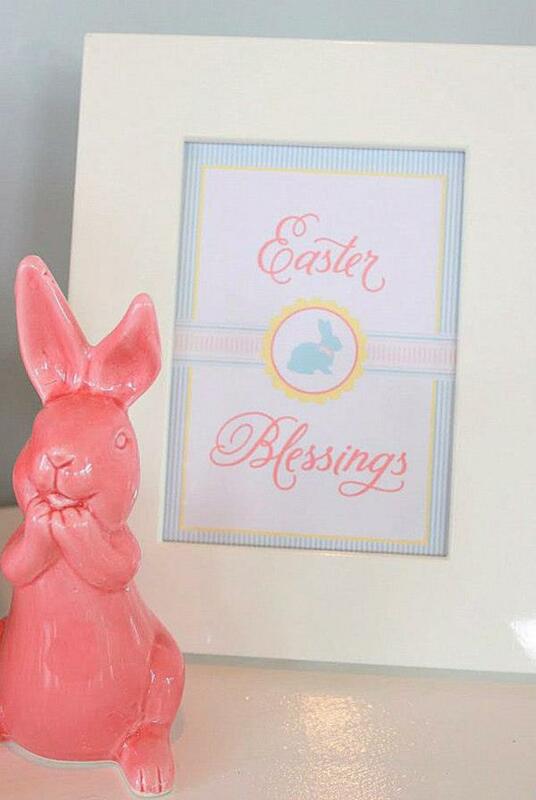 All of the printable paper goods incorporate those colors, along with a pop of coral. The printable paper goods also include a simple stripe, like the seersucker fabric. 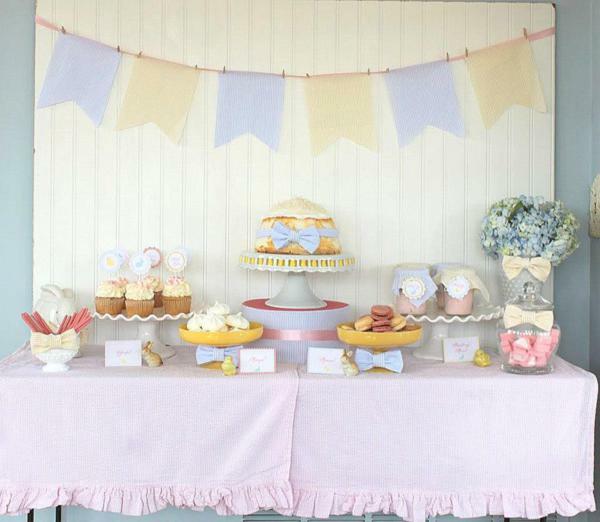 The dessert table was first topped with pink ruffled seersucker table runners that I made. 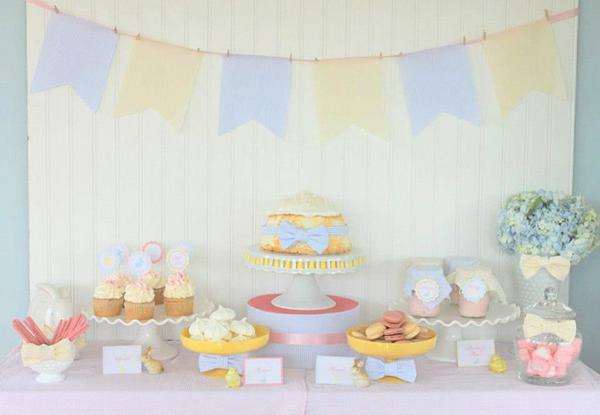 A fabric flag banner, made from yellow and blue seersucker fabric, decorated the bead board backdrop. A white hobnob vase held blue hydrangeas. 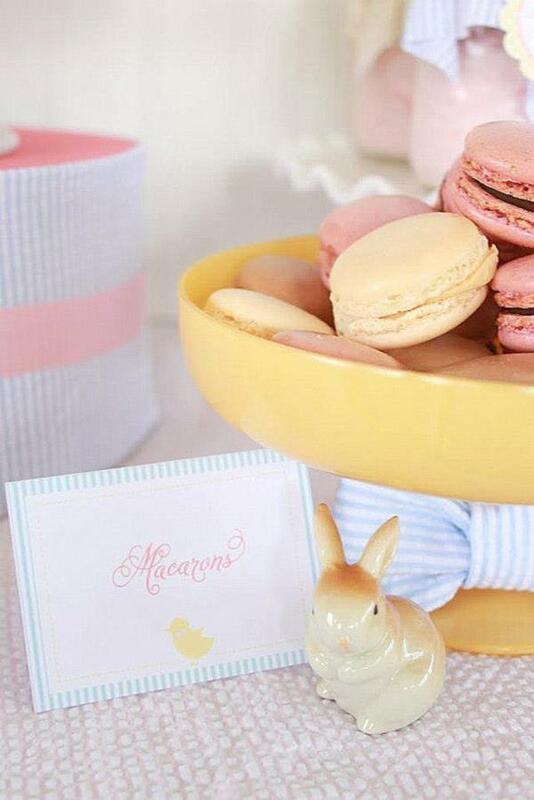 Small ceramic bunnies and chicks were placed on the table for a subtle Easter vibe. 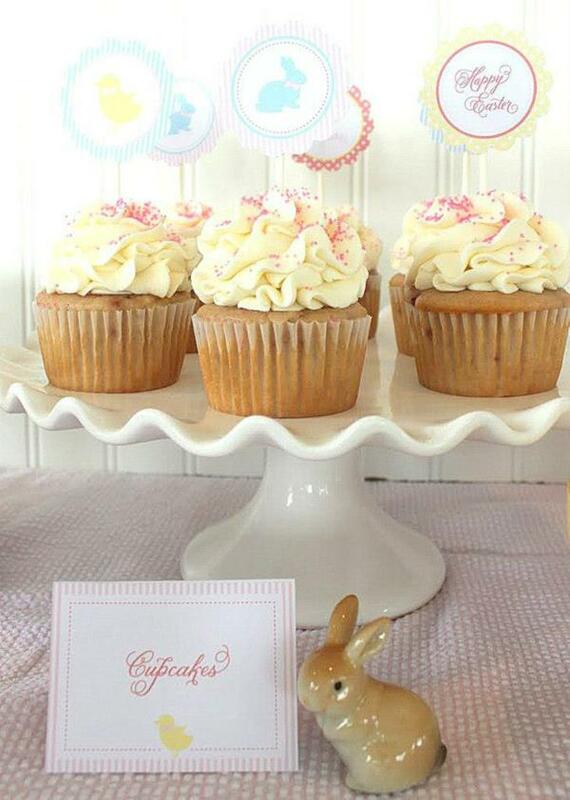 Easter, and the onset of Spring, is the perfect time for light, fresh desserts. Angel Food Cake was topped with whipped frosting and toasted coconut. A hand made bow tie was wrapped around the cake. 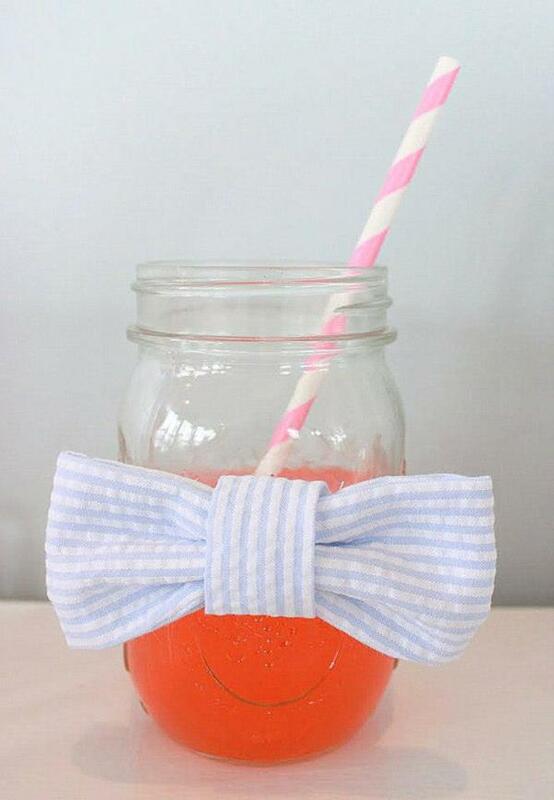 Bow ties also decorated cake stands and candy jars. 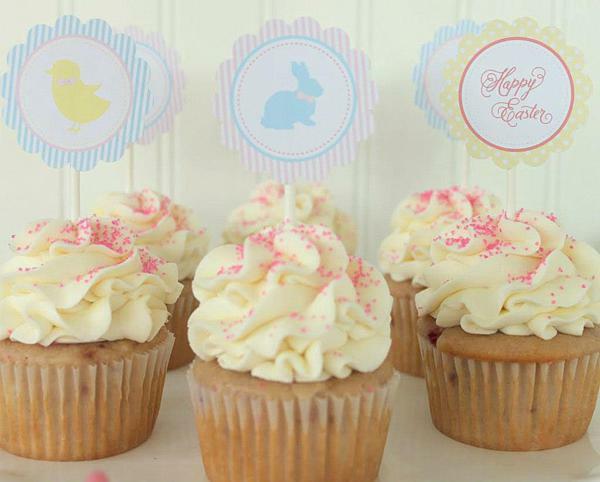 Strawberry Filled Vanilla Cupcakes with Vanilla buttercream were topped with Easter cupcake toppers from the printable paper goods Collection. 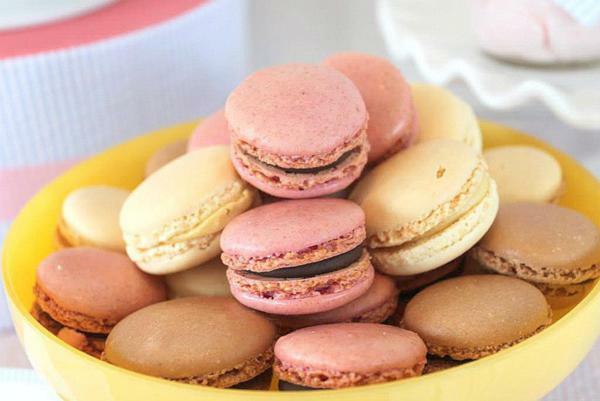 The table also included Strawberry Mousse, Assorted Macarons, and Vanilla Meringues. 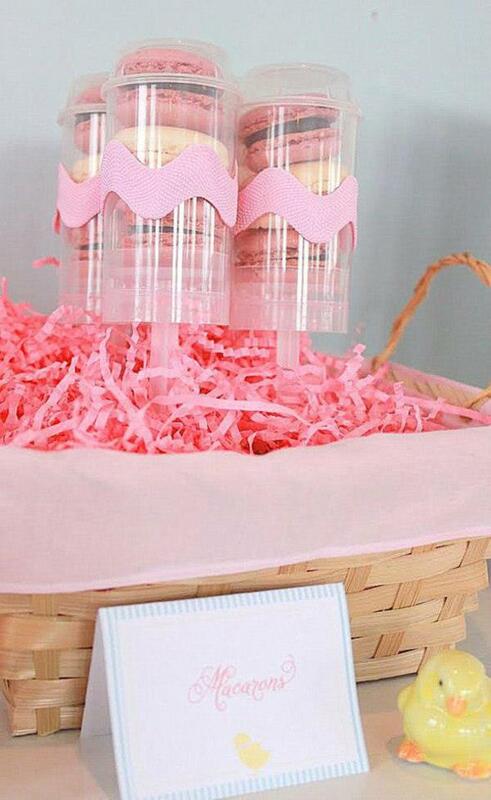 Very sweet, the pastel color scheme is so pretty. 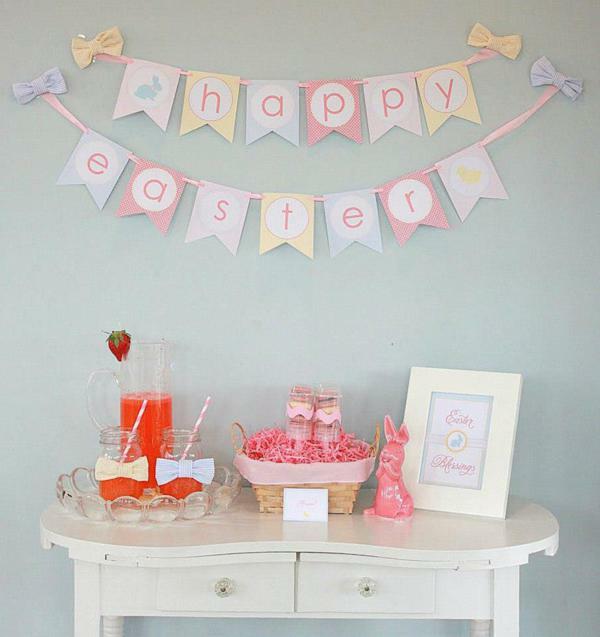 Thank you so much for featuring our Easter party! 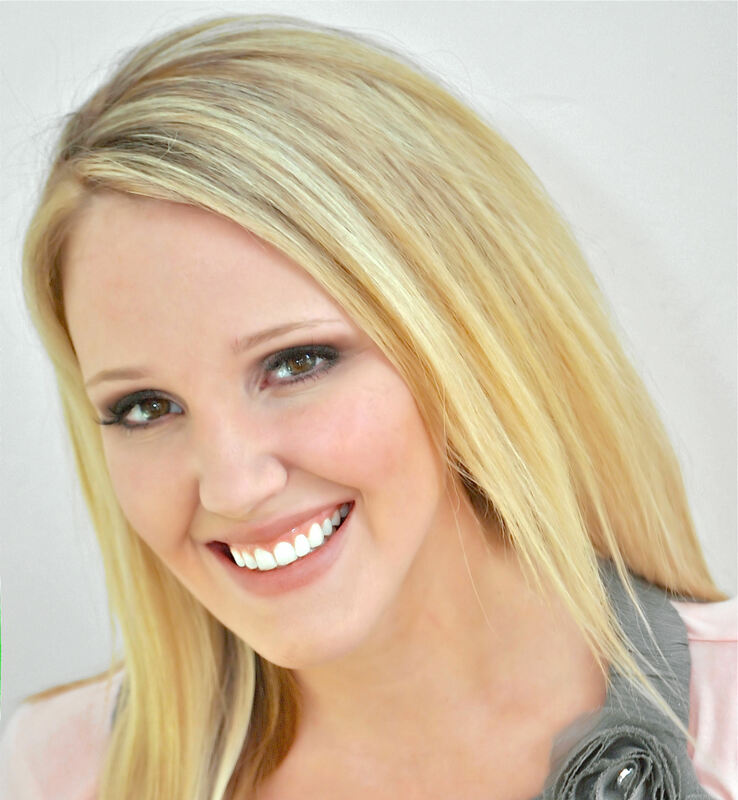 I’m thrilled that you liked it! !